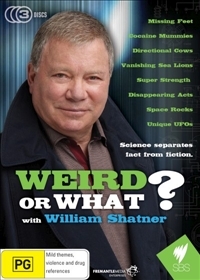 Just like the excellent Ripley's Believe or Not series, William Shatner's Weird or What is of a similar vein and focuses on unsolved mysteries from across the globe. Once again the talented and amusing William Shatner lends his personality to this series as he hosts this intriguing and sometimes obscure show about all sorts of mysteries that will generally have you raising and eyebrow or two in scepticism and disbelief. However, what I enjoy about the series is that Shatner lends his own comedic scepticism to the commentary that at times is quite amusing to listen to, especially some of the "eye witnesses" included in the various episodes. From people saving each other and then reversing the cycle years later or a man falling from a high-rise building and surviving, it's these unexplained phenomena that the series attempt to put a reasoning behind them. Of course, you have to mention the directional cows that is about cows knowing which way is north and south. The DVD quality is presented in widescreen 16:9 with good image quality, although nothing outstanding. The audio quality is acceptable at Dolby Digital 2.0 with Shatner's voice, nice and clear... plus a hint of Shatner grace. There are no special features included this release unfortunately. In conclusion, William Shatner's Weird or What is a thoroughly entertaining series that had me glued to my screen in most parts with only a few segments a little too lame. Nonetheless, it's definitely a fun watch, especially for those that like their documentaries with a touch of the X-Files!